Vanuatu ancestors were from Taiwan and the Philippines. A discovery has sent shock waves through anthropology. The ancestors of Vanuatuans were put in the pot of Pacific Islanders. People of this island do not look like Asians. However, DNA tests on the oldest skeletons found show that the island's first arrivals came from the Philippines and Taiwan only 3,000 years ago. It seems that Australian Aboriginals and New Guineans were not keen to venture out onto the high sea, though Pacific islands were much closer to them than it was for Southeast Asians. Scientists say Papuans moved their later to produce the modern Vanuatuan gene pool. There is a problem here. 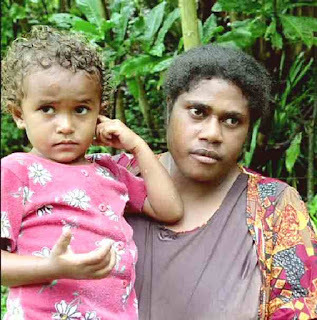 Combining the facial features of say Filipinos and Papuans does not produce modern Vanuatuans. There was earlier movement westward across the large ocean of people from South America. Pacific islanders of South American descent obviously arrived in Vanuatu at some time.